1.The name Lacroix Despheres inspires elegance and somehow sets you in the period of Renaissance. Its meaning it’s “ The Cross of The Sphere “.What’s the story behind this name? Why Lacroix Despheres? Did you choose the band’s name by yourself or together with your bandmates? Thank you. I was inspired by Pythagoras’s „Music of the Spheres”from Ancient Greece. “Sphere” usually is that object we all know , a round ball. But , in our case , Lacroix Despheres, it means the celestial sphere. “Croix” has the meaning of intersection and embodies the symbol of some elements (an orchestra , the band sound, the vocalist , a melody ,musical lines) , and this is what gives to Lacroix Despheres a sense .The band name was Sho’s choice. 2.Many fans out there know you as Pomme, a soldier and member of Kamijo’s Household.How did Sho of Lacroix Despheres become part of Kamijo’s “army”? 3.You graduated from the College of Music Kunitachi and you obtained a degree in classical composition.You could have made a career in the classical music domain.Although, you chose to make your own band and put into practice your own view towards music. How did Lacroix Despheres born ? I chose the College of Music Kunitachi , because I could learn about the music composition and find out more about the classical music techniques necessary to create the music that I wanted . This is what helps me express my beliefs through Lacroix Despheres. After we got together , we participated to „Art Festival” , an event held every year at the College of Music Kunitachi . At that time , we nor brought into discussion the band name . Then ,we played our first piece . 4.Lacroix Despheres ’musical concept is different from the concept of the other regular visual rock bands and shows your creativity. You mix together rock music, classical music and each of you plays the role of a character on the stage. How did you come up with this amazing idea? What did inspire you ? I thought that there must be a way to express various music genres . So, I mixed it with the sound orchestra. It ’s something rare to see when it comes to the visual rock bands, but it is often used in musicals. It gets to that point when they put a story on the stage.It is the same for Lacroix Despheres. I love opera and musicals since I was a child. I used to watch to that type of performances. (By the way, the first musical I saw was „Annie”).During such a performance, the music is played from the orchestra pit. They sit in another area not far from the stage. Meanwhile, the story goes on . Therefore, the leading role in a performance it’s taken by the actor on the stage. The musicians are supporting the actors from the shade . After that, I went to see live Visual-kei bands such as X JAPAN and MALICE MIZER.Seeing all of them on the stage, there was a sense of unity . It ’s what made them a whole unit.In addition, the style of Visual-kei bands can stimulate not only the hearing ,but also the sight. I thought that I could bring a change for the Visual-kei bands by including the story in the live performance . This way we could offer also a beautiful sight of what we want to express. 5.In a interview you stated that all of your albums are based on a story. Which is the story of “ Dernier Paradis”? Please tell us more about it. It’s not something that should surprise you . The action of „Dernier Paradis” actually took place in the Medieval period.There was this sacred song .The Saint Augustine thought that the beautiful music might be against what they taught them , against to what they called „forbidden pleasure”. The one who composed that beautiful song was executed.They brought him false accusations. The main characters in this story are the friends of the composer and the last descendant from the composer’s family. However ,the music sheet they should have destroyed was nowhere to be found. A mysterious organization started to look for the music sheet .On the night of the thirteenth dance festival ,something will happen ! 6.The PV “ Tenkei no Hitomi” it looks really interesting.What ‘s the role of character you are playing on the stage? How about Saya’s character? Is it a love story between the characters you two are playing ? I’m glad to hear that.The character I play is the master of a manor .He appears in the first act . His parents have already died and he lives with his younger sister (Mizuki), butler (Pegeot) and servants.Every year he held a a dance festival .Being the thirteenth dance festival , he will meet with Saya’s character. As it was mentioned before something strange happens, causing commotion .The hall’s basement gets damaged. The character Saya plays is an enigmatic person. The master of the manor has an idea about her true identity .She could be on the evil’s side . Her behavior it’s what makes him think that .I can’t give too many details . It will turn into a spoiler. This is not a love story, but a parent-child love. The brotherhood is a very important keyword. 7.Some fans are seeing Kamijo in you . What do you think about it ? 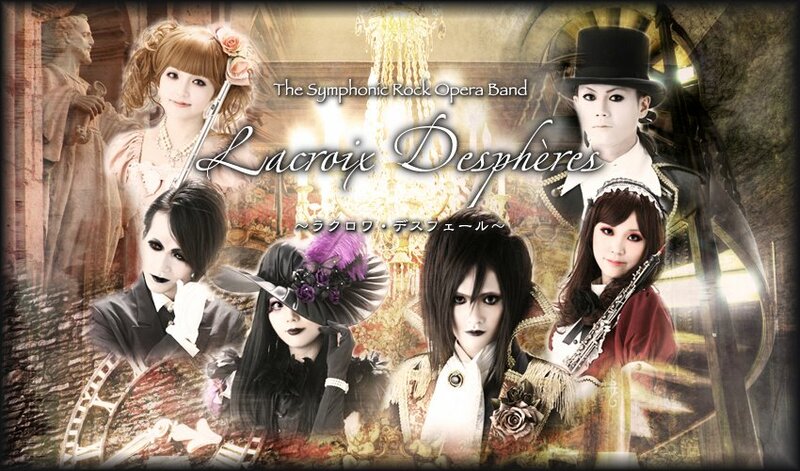 Could Sho of Lacroix Despheres become a next Kamijo? Really? I hear this for the first time !He describes his own world and I’m describing my world. So ,please enjoy both our worlds. 8.We heard you contributed at the recording of „Overloard” ‘s soundtrack. What can you tell us about it? Yes, I took part at the recording of some sound tracks of the anime „Overloard”.I strongly recommend it to the Lacroix Despheres fans. In this sound track you meet also orchestra chorus . I’m glad that I was able to play with REMI and MIKI from Sound Horizon. 9.For many persons this year was a successful one . How was this year so far for you ? What are you planning for the next year? Which are Lacroix Despheres’ plans? Recently,it was our tenth anniversary .It’s been 10 years since we started our activities as Lacroix Despheres.I am so sorry that we have not been able to announce the sale date of „Dernier Paradis act3” yet.Although , after the release of the album, we are planning to perform live all the three acts in Japan and we would like to perform it also overseas.Please look forward to it. 10.Lacroix Despheres is a indie band, but has evolved fastly. How do you see Lacroix Despheres ’ future over a few years? The production of „Dernier Paradis act3” takes more time than we expected, but it should advance smoothly if this work is completed .To aim to more global activities, we must strengthen our connections with the people from overseas in the following years. 11.For the 2nd album “ Dernier Paradis act 2 “ you collaborated with a few known artists such as GLAY , Kuroyume and for the single “ Torikago shoujo no kareinaru dasshutsugeki “ with ANCIENT MYTH’s Naoki. What other artists would you like to collaborate with ? I’d like to play and record with a full orchestra.Since we make the design of our costumes on our own and we also are in charge with the stage direction , I’d like to collaborate with a designer and a stage director. 12.In the Japanese music industry it started to appear many visual kei bands, but many of them end in disbanding after not more than a year or two. How do you see this situation? Each band has its circumstances, but I think that it is too early to disband.I think that such a thing would not happen if there would exist communication between the band members and if they ’d take the matter on their hands. 13.It says everyone has a key to success. What ‘s your key to success? And how do you define the key to success? I think the key to success consists into cooperation and your skills .One person can’t do it on his own , a cooperator being necessary to create something new. I must improve myself to be able to cooperate with someone.I think that the key to success referres to the challenges every person has to deal with . 14.Speaking about success, it makes me think about the relationship between a band/artist and their fans. How should be the relationship between a band and their fans? How is Lacroix Despheres ’ relationship with the fans? A band must show more to their fans , not only what they want. They must show something that the fans wouldn’t expect to .A band can continue its activities only when the fans keeps up supporting the members of that band. By the way ,we opened a membership website to the public . (Opened from the Japanese version).We will take the interactive communication with the fans on this website and we would like to get closer by our fans , to have a better relationship with them. 15.Now , at the end of this interview what would you like to transmit to your fans? Thank you for always supporting Lacroix Despheres.In order to entertain you in the future, we will continue to create a work that only we can make.And please look forward to the day when we will perform in your country.See you soon! Pingback: Lacroix Despheres Official Global Website » New Interview has been published!